If you follow me on Twitter – and thank you if you do – you might have seen a mention of this last week. I try to make sure I donate to Toys for Tots every holiday season, and I’ll definitely do so again this year. I usually make a run to a toy store in early December, grab a bunch of toys, and donate them at our kids’ elementary school, which has a toy drive every year. Or, more specifically, we have our kids bring in the toys and donate them, because I feel like giving to charity is an important lesson to impart. I also remember how magical Christmas was for me as a child, and I hope the donations can help bring someone else that experience. So here’s what I’m doing. I have a stack of Artifacts #1 copies here, which I’ll be autographing and mailing out in exchange for a donations that I’ll collect and give to Toys for Tots. ALL proceeds will go to Toys for Tots, I’m not keeping anything. The cost per Artifacts #1 issue is $13; essentially, $10 for the autographed issue, and $3 to cover first class postage. If you want more than one issue, the cost is $10 for any additional issues, and another $1 for additional postage. So two issues would be $24, three issues would be $35, and so on. All issues will be autographed by me, and I’ll be more than happy to personalize any and all copies. 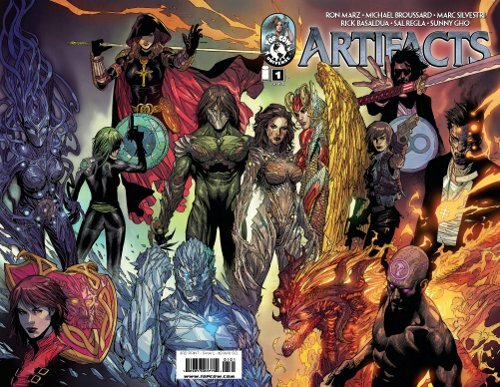 Just to me know who you want the issue to be signed “to.” The issues will be the third-print edition of Artifacts #1 (cover shown here), also known as “Cover L.” For anybody who hasn’t read the issue, it contains some graphic violence and some swearing, so it’s not exactly a kid-friendly comic. The easiest way to do this is through Paypal. The address attached to the Paypal account is: kmarz@nycap.rr.com. When you make the donation, be sure to include all the information I’m going to need: how many issues you want, where the issues should be mailed, and to whom the issues should be signed (if you want them personalized). The goal will be to get issues into the mail within 24 hours of purchase. For anyone who doesn’t have a Paypal account, please use the Contact button on this website and drop me an e-mail; we’ll figure out something. Any questions or concerns, again, use the Contact button. Thanks in advance to anyone who takes advantage of this. Let’s raise a bunch of money that will go to Toys for Tots.